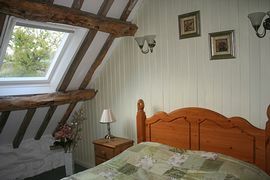 Welcome to Bryniau Barn situated in Snowdonia National Park on the eastern edge overlooking the Conwy valley. A rural position above the village of Llanbedr Y Cennin which sits between the ancient castle walled town of Conwy and the picturesque village of Betws y Coed. Offering lovely views towards the Conwy Estruary and North to Tal Y Fan mountain. 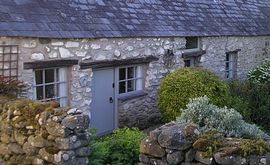 Bryniau Holiday Cottage is an ideal location for a holiday in North Wales and a great base to explore the Beautiful Conwy Valley, the mountains of Snowdonia and North Wales� coast. A great place for outdoor enthusiasts and those looking for a peaceful location to relax and take a well earned break, also ideal for a romantic long weekend. Bryniau Holiday Cottage is an award winning Grade 11 listed barn conversion sympathetically converted with an abundance of original features. Accommodation comprises of Spacious open plan kitchen dining and lounge area. The kitchen is fully equipped with electric oven and hob. 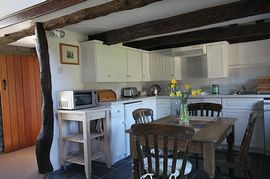 Fridge with ice box, microwave, washing machine, farmhouse kitchen table and chairs, a glazed stable door leads to the patio area and garden. 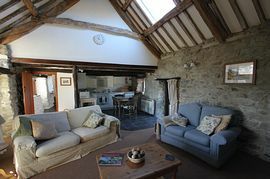 The lounge area has two comfy sofas with cushions and throws, a selection of magazines for you to relax and read, some guidebooks and information so you can plan the next day of your holiday, A multi fuel burner that makes the cottage cosy on a chilly evening and a glazed stable door leading to the front garden. TV and DVD. CD player and Ipod docking station. Upstairs is a gallery style double bedroom (open to staircase above hallway)with original sloping beamed ceiling. A selection of pine furniture providing plent of storage. Please be aware there is a low Apex beam in the bedroom all will need to duck under to reach the bed! The bathroom sits on a half level and has an electric shower, WC and basin with shaver light over. Egyptian cotton towels, handwash and moisturiser provided. 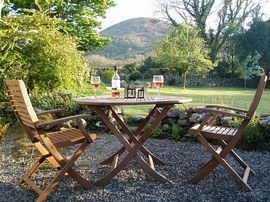 Although Bryniau Holiday cottage stands adjacent to our home it maintains it's privacy and has it's own private patio area which is a sheltered spot that gets the afternoon sun until it disappears behind the mountains in the evening, great for a BBQ or relax and enjoy your favourite beer or wine. You are also welcome to wander around our mature garden and use the various benches to enjoy the peace. You will be met with a warm welcome and what we believe to be some useful basics to include locally baked bread, roast coffee, a selection of tea bags, milk, olive oil, welsh butter, sea salt and black pepper. Sonwdonia offers an abundance of outdoor activities including walking, climbing and canoeing. Gwyder forest is only a short distance away and offers scenic mountain bike trails as well as the Marin trail for some exiting single track. Both Guy and myself are outdoor instructors and can offer advice and information for days on the hill as well as climbing areas, rivers for paddlers and mountain bike routes. We can also offer secure storage for bikes and boats. For those looking to explore the area, other attractions include Conwy Castle, Bodnant Garden, Betws y Coed with its outdoor shops, cafes and waterfalls. Trefriw wells Spa and woollen Mill. Conwy Water Gardens and Pancake House are all in easy reach. A Peaceful location with walks from the door. Local Services: The village of Talybont is 1.5 miles away with a butcher, Post Office and general store. There is also a Post Office in Rowen, which has a selection of food produce. A range of shops and a supermarket can be found in Conwy 5.5 miles and Llanwrst 7.5 miles. Ye Olde Bull in Llanbedr Y Cennin is our local pub, which offers a friendly welcome, good food, real ale and is only 0.5 miles away. There is also a country Pub in Rowen which can be reached on local footpaths if you don't fancy the short drive. Turn off at J19 sign posted to Betws y Coed. Follow the A470 to Tal y Cafn inn, turn right here sign posted Trefriw and Tyn Y Groes. Follow this road to the T junction and turn left on to the B5106 signed Dolgarrog and Trefriw. Drop down the hill a short distance and take the right turn signposted Rowen by a converted church. Follow this road to the end and turn right. Take the second left just after you go over a bridge and the road bears round to the right, follow this narrow and winding road uphill until just past a cross roads a traditional red telephone box comes into view, the entrance to Bryniau Barn is just before the telephone box on your right. Travel through Betws y Coed and take the right turn by the fish and chip shop sign posted Trefriw. Follow the B5106 through Trefriw Dolgarrog and Talyont. Turn Left opposite Caerhun hall sign posted Rowen and Pontwgan. Along this road take the second left as you pass over a bridge and the road bends to the right, climb up the hill along a narrow and winding road until just past a cross roads a traditional red telephone box comes into view, the entrance to Bryniau Melynion is the entrance on the right just before the telephone box. Prices start Low Season from: £270 to £395.00 Peak Season. Short breaks and long weekends are available on request. For any queries regarding Bryniau Barn, prices and availability please contact Belinda and Guy.